If a horse is coughing, or COPD is suspected then immediate equine veterinary attention should be sought. The liquid version of our popular dry mix. Our herbal supplements are formulated to help support healthy, efficient airways and resistance to irritants and infections all year round. 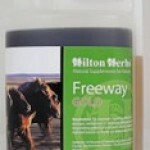 We particularly recommend Freeway for horses if they are stabled or have restricted turnout. Which is better - dry or liquid herbal products? Neither one is better than the other, the simple difference is speed of initial absorption, with the liquid product being absorbed more quickly than the dry. Occasionally a horse or pony will respond better to a dry mix than a liquid, or vice versa, which just reminds us that horses and ponies are individuals. Some people prefer liquids as in the case of fussy feeders they can easily be syringed down the animal's throat with a small plastic syringe. 1. Its not unusual for your horse or pony to have a 'snotty nose' after a week or so being on Freeway, this is just an indication that the herbs are doing their job. 2. Liquorice has been used for both humans and animals for over 3,000 years, and was mentioned in ancient Greek herbal in the third century BC. Its main active constituent glycyrrhizin is responsible for the sweet taste and is over fifty times sweeter than sugar! Up until the 1940's liquorice was cultivated extensively in the north of England, this accounts for the famous Pontefract Cakes, a soft coin shaped liquorice sweet that was named after the Yorkshire town where they were made.